Last September, I had an idea. While riding the crosstown bus, a Dave Matthews Band song popped up on my shuffle. I was reminded of middle school, a time when I considered myself deep and obscure, often filling marble notebooks with sad entries about love lost which, not coincidentally, read like recaps of “Dawson’s Creek” episodes. I searched my favorite social media platform, Twitter, for any account that may have been documenting what I was thinking about — throwbacks to AOL away messages and references to 8th grade dances and Delia’s cargo pants — and found nothing. BuzzFeed had just recently launched their vertical, BuzzFeed Rewind, tirelessly helping millennials recall the days of yore, but no one was offering anything similar on Twitter. 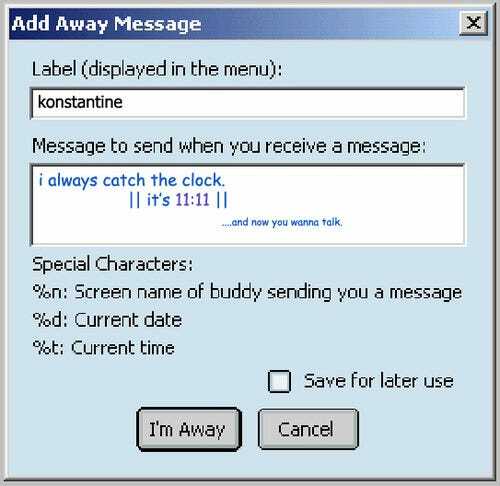 So I created @YourAwayMessage, a Twitter account where I could tweet the types of “away messages” and things I would have said between 1998-2004 in middle and high school. By the time I fell asleep, 1,000 people had started following @YourAwayMessage. All of them were strangers. The Internet can be a negative place, and I feared people would think the account was dumb, or worse: that I was dumb. The odds of creating something on the Internet that people would want to share are slim. What if no one thought I was funny? My thin skin wasn’t ready for potential backlash. The next morning, YAM had 10,000 followers. I had unwittingly tapped into a deep well of unfulfilled nostalgia for the Instant Messenger service and the glory years of pre-pubescent angst. I watched as the account spread across mediums like BuzzFeed, Mashable, and New York Magazine, as well as Z100’s syndicated radio show. After a very surreal week, it had grown to 100,000 followers and I started telling my friends and family that I was the one behind it. I couldn’t believe how lucky I was. I felt like I had hit the jackpot and then got struck by lightning (if getting struck by lightning was a cool and enjoyable thing). As I continued to tweet, people wanted to know what my grand plans for the future were in regards to the feed. The truth was I didn’t have any. I had always kept my expectations in check; I thought it would burn itself out in time. But people wanted immediate answers: Do you want to write a book? Do you want to write a TV series based on the feed? Do you want to sell us the account for a dollar amount? I wasn’t sure. I decided I’d just let whatever happens, happen. Before long, a literary agent reached out to me. The agent asked if I wanted to give “the book thing” a shot. Ultimately, 15 publishing companies rejected our book proposal, but my agent didn’t give up on me. When I wanted to try my hand at freelance writing creatively, she helped make important introductions to people and places who may not have responded to my emails before. Last October, a writer from The Daily Dot reached out to me. He was interested in writing a story about YAM. During the interview, we hit it off, and he helped me get a job as a freelance writer for The Daily Dot. At the time, I was working for a non-profit, but my dream was to be a writer (I majored in journalism but graduated during the recession, when writing jobs for college grads were few and far between). From there, I joined Business Insider. The person who hired me at Business Insider also followed YAM. I hadn’t been a writer before my YAM experience. But thanks to the popularity of the account, I now had something unique to show the industry about myself. While I decided to take credit for YAM, some owners of popular Twitter accounts choose to stay anonymous. Recently I talked to my favorite Internet geniuses, Carey O’Donnell and Eli Yudin, who created @NotTildaSwinton; a parody account that tweets 140-character diatribes in the fictional voice of Tilda Swinton, if Tilda lived in a log cabin in upstate New York. O’Donnell and Yudin chose to keep their identities a secret for the majority of the time they wrote @NotTildaSwinton. “We both felt like it would be more fun to make it more about the character; whether that’s the actual Tilda, or a slightly deranged person living in the woods with decent WiFi,” O’Donnell explained. But O’Donnell and Yudin were also able to accelerate writing careers thanks to their popular Twitter account. The pair now freelances for publications like PaperMag, MTV, SomeECards, and they even wrote a piece in Harper’s Bazaar reviewing the Paris Couture show in the voice of NotTilda. How do you create a large Twitter following quickly, from nothing? One of the things I like most about having YAM is getting emails from people who have started parody or novelty Twitter accounts or Tumblr feeds, wanting my advice on how to make it go viral. Some of them are really good — remember Feminist Taylor Swift? I tell the truth — a lot of it is plain luck. There’s no doubt in my mind that eventually, some version of @YourAwayMessage would have been created by someone else if I hadn’t started it. As simple as it sounds, the takeaway is to not second-guess your ideas or yourself. Things go viral on their own, with tiny bumps in the beginning. Right now, YAM has over 300,000 followers. There are many novelty accounts with over a million. If people think something is good, they will share it. If someone has already done something similar, it’s likely your idea won’t go too far. But don’t talk yourself out of trying something. Novelty Twitter accounts have a very short shelf life. The next new thing is always, and will always be, one click away. But it ends up being a fantastic calling card for more opportunity once the feed can no longer sustain itself. How to get 100,000 followers on twitter – Business Insider.